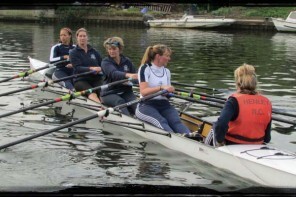 Two crews were entered in the Woman’s Eight Head of the River Race on 5th March 2016. 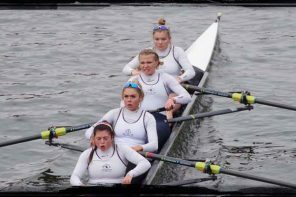 The event is rowed on the 6.8km long tidal section of the River Thames between Mortlake and Putney on the ebb tide with 300 crews from the UK and overseas competing in the most prestigious women’s head race of the season. Conditions during the race were harsh with a cold northerly wind and occasional rain and hail, making conditions choppy in places. Henley’s Junior crew were given a start number of 25 after a good performance last year. The crew of Lauren Kay, Lily Stimpson, Ella Morgan, Georgina Robinson Ranger, Lottie Orr, Georgia Edwards, Clare Pearson, and Issy Jonsson, coxed by Emma Lister, put in an excellent performance finishing third in their category, and thirteenth overall. 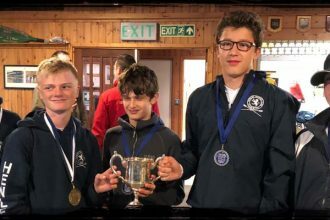 Their time of twenty minutes and four seconds was just 11 seconds behind Headington School and the winners Cus Milano Lombardia, from Italy. suffer. The girls J15 squad now look forward to competing in the Schools Head in mid March, looking to go one better and win the J15 girls pennant.